By rawritzrichii, seek consent before reposting. What needs to be understood before we begin today is that all Oracle Think Tank decks are using essentially the same strategy. They differ only in the means by which the strategy comes together. OraThin draws many cards to outlast the opponent with smart defense while using their unique access to every card in their deck to quickly set up a particular offense. So despite their differences in play, all three OraThin decks currently available to the English game, and the four available to the Japanese game, have the same ultimate goal. However, one of these decks has been a national championship deck and the others have not. 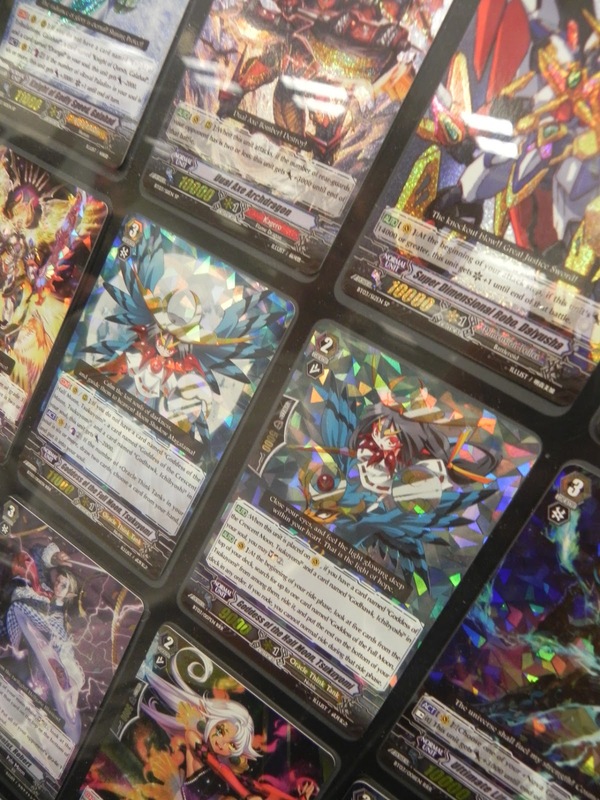 Much like The End and Majesty Lord Blaster, Tsukuyomi has been a very popular deck since her introduction, but until the past week none of these decks had ever taken a national title, and the Full Moon strategy still has yet to. There are several ways to examine this, but first consider how many cards each deck actively gains. Under ideal circumstances in which 6 cards enter the soul, Tsukuyomi generally sees two succesful superior rides per game and with one CB2 a net advantage of +3 while sometimes adding a temporary -1 to the opponent for the turn with Euryale. That's a total difference of four cards. CoCo on the other hand, calls LuLu, uses her soulblast and CoCo's counterblast for +1, +1 and +2. Similar to Tsukuyomi, that's a four-card difference. The divide between them comes in methods. LuLu will never fail as long as the soul is conserved for a grade 3 ride, and CoCo will likewise always go off as long as she has two damage open, while it is very possible for Tsukuyomi to never get off a superior ride or six soul. Unless the six-soul criteria is met, there can be no advantage for the Goddess, so CoCo is more consistent. The next divide is in how cards are handled--Tsukuyomi is constantly soulcharging with Red-Eye, her own skill and Amaterasu. This removes many more cards from the deck than with the Scarlet Witch, and all happens on top of taking more cards out of the deck with superior rides. Under the ideal circumstances previously mentioned, in these ways a Full Moon deck would take out eight cards from the deck, two from rides, two from Red-Eye, two from Goddess of the Half Moon's soulcharge skill and two from Full Moon's draw skill. About eleven other cards would come out by the end of the third turn through normal play (draw, damage and drive check), with six leaving the deck at the start of the game for 25 total--half of the deck. Compare to CoCo's ideal play, which by the same time has 21 out and 29 in. Under these conditions, it would take CoCo about two-to-three turns longer to deck out than Tsukuyomi, and that too is a fundamental difference. Both decks achieve the same number of extra cards, but CoCo does so without decking out as quickly. And while Tsukuyomi has access to Battle Maiden, Tagitsuhime to form up with Gemini for base 20000 lines, CoCo has an arguably easier time creating the 18000 rearguard lines that are more important to the postcrossride format. While both decks have access to Battle Sister, Mocha, who makes a very easy 18000 line with Dark Cat, only CoCo can use Glace, who forms the same line under the conditions of having zero soul and is thus much easier to trigger than Tagitsuhime. CoCo's access to Sakuya as a backup vanguard is also helpful because it allows for an extra 10000 shield to be grabbed off of LuLu, and both units can break 23000 power with Milk for combating The End, Great Daiyuusha and similar units while Tsukuyomi's power is capped at 21000. Until the arrival of the restricted list in December 2012, both decks had access to Silent Tom in the Japanese scene, where the two decks have been primarily open for comparison. Since Silent Tom outshines Tagitsuhime so thoroughly by requiring the same number of lost cards from all but crossrides, without the soul restriction, there has been a certain mentality of late that if Tom, Glace and Mocha can all be best used by CoCo while Tagitsuhime does not come with the same consistency, then the Scarlet Witch may as well be run instead of her to begin with due to having greater consistency and rearguard support. At the WCS2012 Chicago regional tournament, one thing that I continually noticed was that Tsukuyomi decks were not usually losing their fights, but were instead decking out. Memorably, one finalist commented that he would "die on his own sword" rather than lose to Bastianelli's Duke Dragon deck in the top four, and ended up drive checking all of the remaining cards in his deck. Tsukuyomi filled third and fourth place in the regional because of these deck-outs. It's no coincidence--the build can defend virtually forever, but the deck itself lacks the same stamina as its fighters. If Tsukuyomi were to one day receive support cards that could take cards out of the drop zone and inject them back into the deck, then she may see a resurgence in the pro scene, but as the deck is already very well off without additional cards and Bushiroad seems intent on creating new styles of play rather than bolstering old ones, for now it appears that it's CoCo's turn for the spotlight. In summary, Tsukuyomi's key problems are the toll that her soulcharging takes on her deck, her inability to break 23000 power, her lack of access to low-maintenance rearguards, and Amaterasu not providing equal benefits when compared to Sakuya as an alternative winning image. CoCo's strengths give her a distinct advantage by answering all of these problems, but the new model of Full Moon deck presented by Tanaka Shouta and his contemporaries introduces new factors by giving greater grade security, additional pressure from maximized Tom, Red-Eye counts in addition to Mocha, and not being reliant on Dark Cat to reach the deck's stack. Whether or not this type of Tsukuyomi deck will prove as successful in the English format where CoCo is being established simultaneously rather than after the fact, and how the new restriction-enforced Goddess of the Sun-Full Moon hybrid deck will be able cope with these old challenges in the Japanese format will have to evaluated in the future. For the time being, upcoming event tournaments and Fighter's Road 2013 seem to be our best bet for further analyzing these decks in the days to come.